I fundamentally don’t care for texting. I have big hands and fingers which makes for a challenging texting experience when using my cell phone. I want to stay in touch with my younger cousins who are in their teens and early twenties. However, I have noticed they take forever to reply to any voicemail I leave them on their cell phone, but let me send a text and I almost get an instant reply. My solution? Email texting. I have been sending emails longer than most of my cousins have been alive. I now can merge email which I love and texting which they love. Just about every cell phone carrier has an address you can use to send an emailtext to. The format of the address is the 10 digit cell phone number of the person you want to reach followed by the carrier’s extension. For example, let’s say that I want to send an emailtext to my cousin Melissa’s cell phone. Let’s say her number is 404-123-4567 and her cell phone service is with AT&T. To send her a text using my email program, I would simply type the following into the TO: field, 4041234567@text.att.net. After clicking send, my emailtext would be on its way to her phone. In about 3 minutes I would have a reply from her. Had I called and left a voice mail, she MIGHT have called me back around Christmas time. There are two things you need to consider, the same texting rates apply to the person you are sending the email text to. 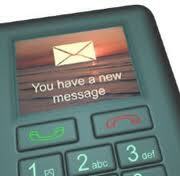 Don’t think they don’t just because you are not sending the text from your phone to their phone. Also, your emailtext message is still limited to 160 characters.